The latest study by the NAFC Marine Centre in Shetland provides further detail on research findings published in October, when it emerged 58% of the haul was taken by non-UK boats. Fishing chiefs were quick to jump on last month’s figure, saying it highlighted a “sea of opportunity” after Brexit. NAFC has now identified who caught what in the UK’s exclusive economic zone (EEZ) – an area extending up to 200 nautical miles from Britain’s coast, or to the median line between the UK and other countries. Ian Napier, senior policy adviser at the Scalloway centre, said Denmark’s estimated 200,000tonne-plus annual haul of fish and shellfish in the EEZ was more than one-third of the total caught by non-UK boats. The next biggest haul of fish and shellfish taken from the UK EEZ was by Dutch boats, with 21% of the non-UK total. Ireland and France both accounted for 14%. Belgian vessels caught less but their haul represented nearly half of their country’s overall landings by weight. French boats accounted for more than half (58%) of the white-fish landed from the UK EEZ by non-UK vessels, while Denmark had the biggest non-UK pelagic catch (31%), followed by the Netherlands (28%), Ireland (17%) and Germany (10%). Nearly half (48%) of shellfish landings from the UK EEZ by non-UK EU boats (48%) were by French boats, with Irish and Belgian vessels accounting for 38% and 10% respectively. 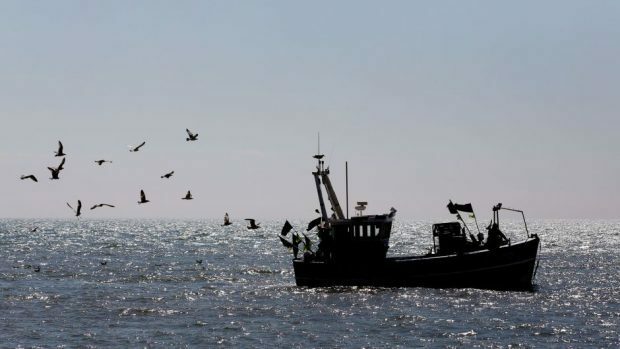 Scottish Fishermen’s Federation chief executive Bertie Armstrong said: “These figures highlight how regaining control of our exclusive economic zone would benefit all sectors of our fishing fleet, including demersal (white-fish), pelagic and shellfish. “We are in no doubt that Brexit provides a sea of opportunity for the UK and especially for Scotland, given that we land the bulk of the UK catch from our rich northern waters. Fisheries Minister Fergus Ewing said: “We welcome this further analysis, which shows the importance of protecting Scotland’s waters.